With all the geopolitical turmoil in the world many people have taken an increased interest in end-times prophecies. As Christians, we see many current events, not as something that is new and frightening, but as literal fulfillment of many signs that the Bible says would occur before Jesus returns. With these exciting times, many are asking questions about passages in the book of Revelation. One in particular is, who are the 24 elders in the book of Revelation? A short study of this passage and supporting passages will provide us the answer. Where is the reference to the 24 elders located? What is the context of the 24 elders mentioned in Revelation? The book of Revelation was written by the Apostle John under the inspiration of the Holy Spirit and direct revelation from Jesus Christ in a vision (Revelation 1:4-11). The entire book can be divided into three sections of time: the past, the present, and the future (Revelation 1:4) Like the book of Isaiah, it was written to God’s people to let them know God’s plan for them and those who would follow after them (Isaiah 42:9, Revelation 1:19). The first chapter describes the past; the second and third chapters describe the present (when written); and chapter four through the rest of the book describe the future. What is the first clue about the identity of the 24 elders? The beginning of Revelation 4 describes a transition from the age of the church on earth through the resurrection. John’s vision describes hearing a voice like a trumpet calling him up to heaven where he was immediately in the throne room of God. Surrounding the throne were 24 seats that were occupied by 24 elders clothed in white raiment (clothing) and wearing crowns of gold. This gives us the first clue as to the identity of the 24 elders, the raiment, and crowns. According to Revelation 3:5, 18; Revelation 11:15-16; and Revelation 19:8, the white raiment represents those who are declared righteous by God by grace through faith in Christ (Ephesians 2:8-9). The crowns are given by God to believers for several reasons (1 Corinthians 9:25-27; Revelation 2:10; James 1:12; 1 Peter 5:2-4; 2 Timothy 4:8; and 1 Thessalonians 2:19-20). This description of the 24 elders tells us that they were believers that had trusted Christ as their Savior. What is the second clue about the identity of the 24 elders? The second clue about the 24 elders is that there were 24. This is significant in that there were 12 tribes of Israel and 12 Apostles. The connection is seen in Revelation 4:3-4 in the stones worn by the one (God) sitting on the throne: jasper, sardine, and emerald. These were stones that were worn along with nine others in the High Priest’s breastplate (Exodus 28:15-21). However, the stones worn here and their reverse order of mention has great significance. Jasper is a clear stone that was representative of the tribe of Benjamin, the last born of Jacob. The name Benjamin means “The son of my power.” Sardine is a blood-red stone that was representative of the tribe of Reuben, the firstborn of Jacob. The name Reuben means “Behold the Son.” Finally, the emerald is a green stone that represents the tribe of Judah, of which Jesus was born into as a man. The name Judah means “praise.” These three represent Jesus as the first-born Lamb and Son of God (past – sardine), second coming of Christ in power (future – jasper), and eternal praise of Jesus Christ (eternity past to eternity future – emerald). What is the final clue about the identity of the 24 elders? Combined these stones also represent the message of the Old Testament prophets along with the New Testament Apostles who laid the foundations of the written Word of God (Luke 11:47-51; 1 Corinthians 3:9-14; Ephesians 2:14-22; Hebrews 6:1). No longer is there a division between the former Jew and gentile when they become one in Christ as the church (Ephesians 2:11-22; 1 Corinthians 10:32). As the church, these elders are not to be confused with being part of the earthly organizational local churches. Instead, these elders are part of the universal church, believers from all ages in the shed blood of Christ for the forgiveness of their sins, that one day, at the resurrection, will all be together in heaven. 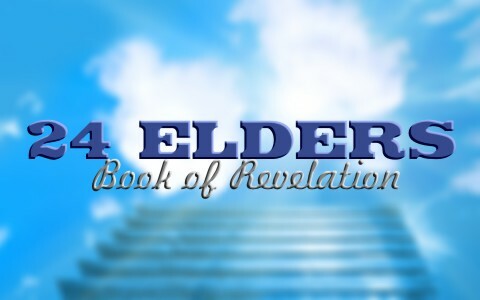 The reference to the 24 elders in the book of Revelation can be first found in Revelation 4:1-5. There are three clues that the Bible gives about the identity of the elders. The first clue is found in the apparel worn by the elders. The second clue is found in the number of elders and their role in laying the foundations of the Old and New Testaments of Scripture as represented by priestly breastplate stones worn by God on the throne. The final clue is found in the message of the coming Christ written by the Old Testament prophets along with the New Testament Apostles who saw Christ. These clues, along with numerous other references, show us that the 24 elders are former Jews and Gentiles, Prophets and Apostles, who are in heaven as members of the universal church made up of all of humanity that has trusted Christ as their Savior. Probably Elijah (the man never died), Moses (he too has a mysterious grave), Another man from the times of Adam the 1st man to never die (cant remember his name), I am thinking mostly all the guys with mysterious death or no deaths at all, as well as these prophets who saw these things like Isaiah and John himself and others. This is great, i was looking for the meaning of the 7 stars and angels and about candles but at last 24 elders. glory to our lord Jesus. stay blessed the translator. This would account for 12 of the 24 thrones, mentioned in Rev 4, who are to judge the 12 Tribes of Israel(144,000). Some believe that the 144,000 is the same group as the 24 elders but the scriptures never mention 144,000 thrones and 144,000 people with 144,000 crowns on their heads. In fact the 144,000 group is standing in front of the 24 elders singing a song only THEY, the 144,000,can master. Hello my friend. Some people believe these twenty-four elders represent Israel, but at the time of this vision, Israel as a whole nation had not yet been redeemed. The elders cannot represent tribulation saints for the same reason—not all had yet been converted at the time of John’s vision. The most likely option is that the elders represent the raptured Church which sings songs of redemption (Revelation 5:8-10). They wear the crowns of victory and have gone to the place prepared for them by their Redeemer (John 14:1-4), so the 24 elders represent the church…12 being a number of authority and may represent the Old Testament saints (12) and the New Testament saints (12). That is what most scholars believe. Previous post: Why Can’t I Get To Heaven Through Good Works? Next post: Why Did God Say He Loved Jacob and Hated Esau?